Jaggery as we know as natural product of sugar but it has benefits for your healthy being, so let's check these out..
We all know “Jaggery” as sugar in its natural form and when I remember , it carries a kind of special relation with winter, which further enhances its consumption even more and proves joyful for the mood also. 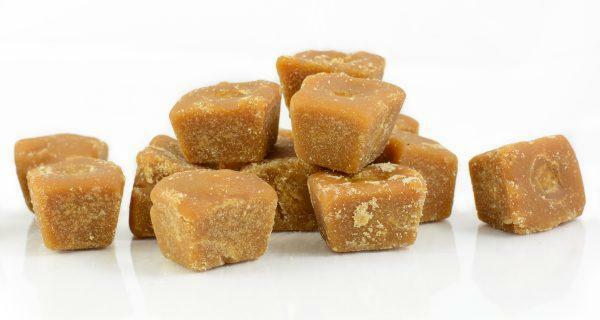 There might be some people like me, who wouldn’t like jaggery, the reason may be sweet and literally a kind of shivering feeling caused by teeth. As jaggery is caused to be a natural product of sugar, so there are chances that fitness conscious people may not consume jaggery as an essential food and be the most stance unaware of this important fact that “jaggery” can give you and provide you with everyday life its simple benefits to the body, could give a boost to your aging skin and is as important for your body providing essential vitamins and minerals in that proper amount. Jaggery being a powerful source helps in sucking out of the toxins being made inside everyday, we people come in continuous contact of pollution and outer impure air inhalation promotes toxins. Jaggery further helps in blood circulation along with purifying blood promoting healthy skin. Along with the boon of glowing skin, it stops the occurrence of fine lines and wrinkles that might appear for ladies running into their 30’s. Along with upliftment of skin, its helps in making mood great. Hey! Great news for women, having the problem of pimples, and reoccurring pimples. Tip: Just mix a piece of (jaggery) in some tomato juice, warm green tea along with a pinch of turmeric powder. Apply to face for five minutes and then wash it. Blackheads, pimples or black spots will vanish in few moments. Consuming jaggery oftenly helps to grow your hair thick, soft and shiny along with strengthening of hair roots. Tip: Mix jaggery in Fuller’s clay(if found) with thick yogurt and water, just apply one hour before hair wash. Consumption of small amount of jaggery with meal could even control the asthma occurence of the patients. Here are some surprising benefits of jaggery for internal as well as external health.